Face-recognition technology is already helping surveillance cameras pick out individual faces of suspects, and even smartphone apps may soon allow you to ID strangers on the street. Privacy lovers could soon paint on anti-face-recognition camo that protects against being identified. Adam Harvey, a designer and technologist with NYU's Interactive Telecommunications Program, has begun reverse-engineering algorithms behind face detection. He generated a series of blocky images that could become the "building blocks of anti-surveillance makeup," and focused on the simplest yet most important patterns for foiling the face-recognition tech. Anti-Face-Recognition Camo Images with a red square represent those where a face was found, whereas no red square meant the face escaped detection. "TEST PATTERNS" marks patterns made according to the reverse-engineering, while "RANDOM PATTERNS" shows random doodles made without the benefit of face-detection patterns. 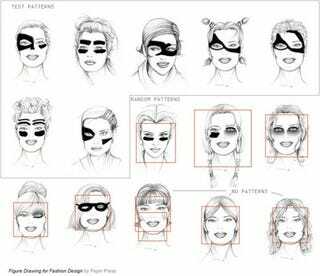 "NO PATTERNS" simply indicates how face detection algorithms work even on basic line drawings. Some patterns that successfully hid faces from detection are surprisingly small, Harvey notes. Those included a few patches scattered primarily around the eye region, whereas larger beard-like patterns sometimes ended up being detected. Of course, walking around with such face paint on might raise an eyebrow or two among human observers anyway, unless you claim to be an Avatar fanboy or fangirl. You can also go with the alternate excuses of citing Blade Runner or Flock of Seagulls as inspiration for the makeup. Children of the '80s unite! This post by Jeremy Hsu originally appeared on Popular Science.